With a few additions, hand trucks become excellent surf fishing carts. Lugging a cooler and all of your rods, tackle and tools from your truck down to the water – or, worse, back up to the truck when heading home – is a chore. You can sidestep this entire problem by using a surf fishing cart to help you wheel your gear with ease. It is easy to build your own cart – and save money in the process -- by customizing a wagon or hand truck. The most difficult part of a surf cart to build – and the one most likely to cause problems – is the wheels. Accordingly, start with a wheeled base to which you can add rod holders and other items. You can use two-wheeled items, such as hand trucks or rolling luggage caddies, or four-wheeled items, such as wagons and rolling tables. Two-wheeled designs usually take up less space and are easier to transport, but four-wheeled designs are better for supporting heavier loads and carrying more equipment. While building axles and wheels is beyond the skills of most DIYers, it is often easy to upgrade the tires on a wagon or hand truck. This is fortunate as large, treaded tires roll much better across deep sand than small, slick wheels do. Seek out large tires that are compatible with the wheels you have incorporated into the cart. If your wheels do not feature removable tires, you can try to find larger wheels that are compatible with the axle in use. If you use air-filled tires, consider strapping a bicycle pump and pressure gauge to the cart to keep the tires properly inflated. 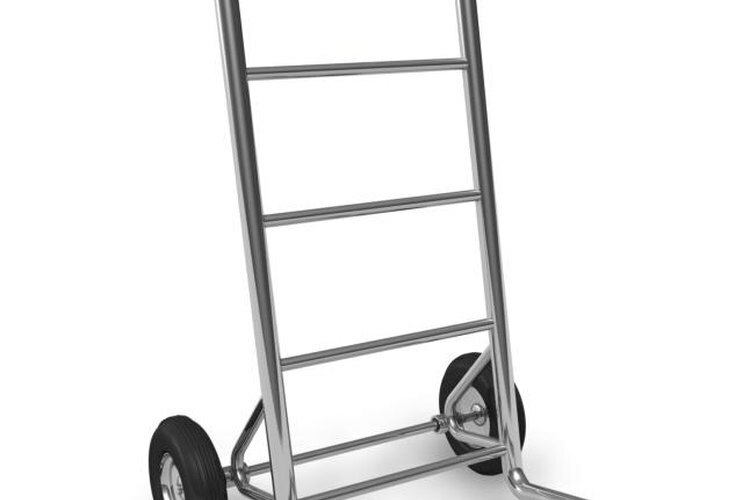 You will need to add a frame to your hand truck or wagon to enable it to carry your cooler, rods and other items. PVC pipe is an excellent material for the frame, as it is easy to work with, lightweight, durable and inexpensive. Design and construct the frame by joining straight pipe sections with angled connectors. You can use end caps to keep sand and debris from ending up inside the pipes, but you can also leave vertical pipes uncapped, thereby allowing you to use them as rod holders. If you prefer, you can strap plastic tote boxes to a hand truck or cart instead of constructing a PVC frame. The beauty of building your own fishing cart is that you can customize it to suit your individual needs. Most carts feature a way to carry your rods and a cooler, but aside from this, cart features are as varied as the anglers using them. Those who fish with live bait are well served by installing a small live well on their cart, whereas those who prefer to cast jigs, spoons and other artificial lures may benefit more by adding plastic storage boxes to their cart. If you like to clean your catch before leaving the beach, consider adding a small, fold-down filet table to your cart. If you add an umbrella to the top of your cart, you can keep your cart cooler and fish in the shade.